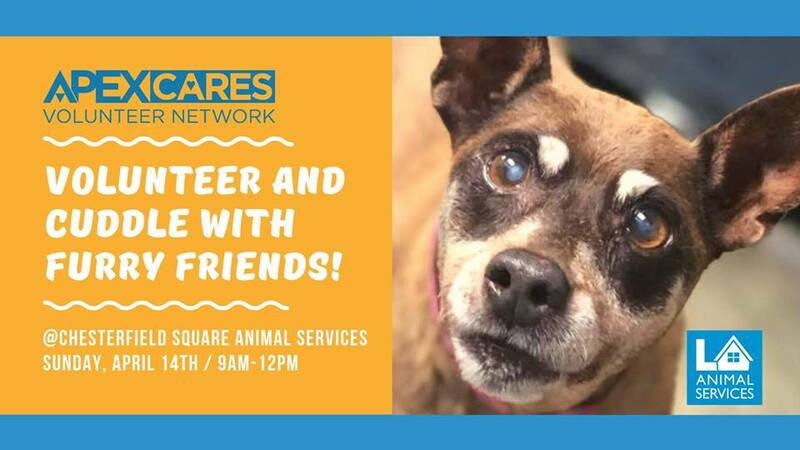 Join us for a morning of care and socialization at the Chesterfield Square Animal Services Center. Your time will help ensure that the animals get the care, attention, and socialization they need in order for them to find future homes to go to. Our care segment will be focused on preparations in the rabbit room, but don’t worry, we don’t discriminate – there will be dogs and potentially cats that need socialization as well! We’ll also be organizing a lunch together (at your own expense) afterwards for a well-deserved celebration! *NOTE* We do have a max capacity of 20 people so be sure to sign up ASAP! For any questions, please contact us at apexcares@apex.org. The Chesterfield Square Animal Services Center is run by Los Angeles Animal Services, which is one of the largest municipal shelter systems in the U.S., serving approximately 60,000 animals annually!